That’s not what I want, App Store. 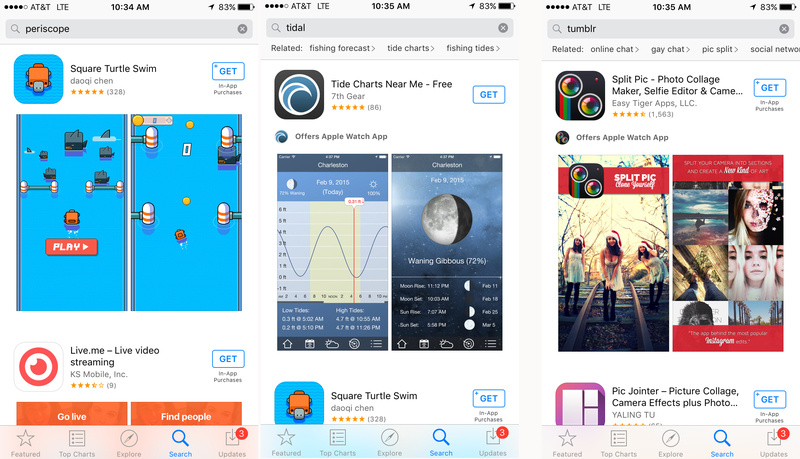 UPDATE: As of about noon on the east coast, the App Store seems to have sorted itself out. I was able to search for Tidal and actually get the music app, instead of an app to track the tide. If you were looking to listen to some music on your iPhone using that new service Tidal, perhaps you’d rather get tide charts near you for free? Or maybe you thought you wanted to use Tumblr on your iPad — but hey, never mind, how about making some photo collages? Apple’s App Store has been having a bit of a fit this morning, and is apparently refusing to locate some popular apps. MacRumors started noticing a bunch of people complaining on Reddit and Twitter on Thursday morning about the App Store preventing many popular iOS apps from appearing in search results — unless you already have them installed. Some on the list: Google, Periscope, Spotify, Tidal, Tumblr, Uber, Vine, Waze, and more. I tried it for myself with a few apps I don’t have downloaded on my phone, and didn’t get the correct results either, as seen in the photo above. The search issues seem to affect all devices — iPhones, iPads, and the iPod Touch — and according to Apple, “all users are affected,” which would seem to indicate the problem is a global one.